You can see a visual guide of common gestures on the gestures design patterns guide. See the new Material Design information about the touch mechanics behind gestures too. 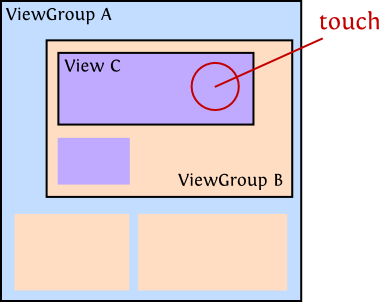 Note that every touch event can be propagated through the entire affected view hierarchy. Not only can the touched view respond to the event but every layout that contains the view has an opportunity as well. Refer to the understanding touch events section for a detailed overview. The events associated with other pointers usually start with MotionEvent.ACTION_POINTER such as MotionEvent.ACTION_POINTER_DOWN and MotionEvent.ACTION_POINTER_UP. The getPointerCount() on the MotionEvent can be used to determine how many pointers are active in this touch sequence. Within an onTouch event, we can then use a GestureDetector to understand gestures based on a series of motion events. Gestures are often used for user interactions within an app. Let's take a look at how to implement common gestures. For easy gesture detection using a third-party library, check out the popular Sensey library which greatly simplifies the process of attaching multiple gestures to your views. Now that view will be able to respond to a double tap event and you can handle the event accordingly. Detecting finger swipes in a particular direction is best done using the built-in onFling event in the GestureDetector.OnGestureListener. With that code in place, swipe gestures should be easily manageable. If you intend to implement pull-to-refresh capabilities in your RecyclerView, you can leverage the built-in SwipeRefreshLayout as described here. If you wish to handle your own swipe detection, you can use the new OnFlingListener as described in this section. If you are interested in having a ListView that recognizes swipe gestures for each item, consider using the popular third-party library android-swipelistview which is a ListView replacement that supports swipe-eable items. Once setup, you can configure a layout that will appear when the item is swiped. Now front will be displayed by default and if I swipe left on an item, then the back will be displayed for that item. This simplifies swipes for the common case of menus for a ListView. Another more recent alternative is the AndroidSwipeLayout library which can be more flexible and is worth checking out as an alternative. Using the ScaleGestureDetector makes managing this fairly straightforward. // Any implementation of ImageView can be used! Check out the PhotoView readme and sample for more details. You can also check the TouchImageView library which is a nice alternative. Scrolling is a common gesture associated with lists of items within a ListView or RecyclerView. Often the scrolling is associated with the hiding of certain elements (toolbar) or the shrinking or morphing of elements such as a parallax header. If you are using a RecyclerView, check out the addOnScrollListener. With a ListView, we can use the setOnScrollListener instead. With Android "M" and the release of the Design Support Library, the CoordinatorLayout was introduced which enables handling changes associated with the scrolling of a RecyclerView. Review the Handling Scrolls with CoordinatorLayout guide for a detailed breakdown of how to manage scrolls using this new layout to collapse the toolbar or hide and reveal header content. Dragging and dropping views is not particularly difficult to do thanks to the OnDragListener built in since API 11. Unfortunately, to support gingerbread managing drag and drop becomes much more manual as you have to implement it using the onTouch handlers. With API 11 and above, you can leverage the built in drag handling. // Signals the start of a drag and drop operation. // entered the bounding box of the View. // outside the bounding box of the View. // and the drag point is within the bounding box of the View. // Signals to a View that the drag and drop operation has concluded. Check out the vogella dragging tutorial or the javapapers dragging tutorial for a detailed look at handling dragging and dropping. Read the official drag and drop guide for a more detail overview. Now we just have to implement the expected behavior for the shaking event in the two methods from the callback. For additional multi-touch events such as "rotation" of fingers, finger movement events, etc., be sure to check out libraries such as Sensey and multitouch-gesture-detectors third-party library. Read the documentation for more details about how to handle multi-touch gestures. Also, for a more generic approach, read the official multitouch guide. See this blog post for more details about how multi-touch events work. "Order" above defines which of these methods gets invoked first when a touch is initiated. Note that above in "invoked on" A represents Activity, VG is ViewGroup, V is View describing where the method is invoked during a touch event. Review this example carefully as all sections below will be referring to the example presented here. The DOWN touch event is passed to "View C" onTouchEvent and the boolean result of TRUE or FALSE determines if the action is captured. Because "View C" returns true and is handling the gesture, the event is not passed to "ViewGroup B"'s nor "ViewGroup A"'s onTouchEvent methods. Because View C says it's handling the gesture, any additional events in this gesture will also be passed to "View C"'s onTouchEvent method until the gesture ends with an UP touch event. The DOWN event is passed upward to "ViewGroup B" onTouchEvent method, and the boolean result determines if the event continues to propagate. The DOWN event on "View C" is first passed to "ViewGroup A" onInterceptTouchEvent, which can return false or true depending on if it wants to intercept the touch. If false, the event is then passed to "ViewGroup B" onInterceptTouchEvent can also return false or true depending on if it wants to intercept the touch. Next the DOWN event is passed to "View C" onTouchEvent which can return true to handle the event. Additional touch events within the same gesture are still passed to A and B's onInterceptTouchEvent before being called on "View C" onTouchEvent even if the ancestors chose not to previously intercept. The takeaway here is that any viewgroup can choose to implement onInterceptTouchEvent and effectively decide to steal touch events from any of the child views. If the children choose not respond to the touch once received, then the touch event is propagated back upwards through the onTouchEvent of each of the containing ViewGroup as described in the previous section. The Activity.dispatchTouchEvent() is called for the current activity containing the view. If the activity chooses not to "consume" the event (and stop propagation), the event is passed to the "ViewGroup A" dispatchTouchEvent since A is the outermost viewgroup affected by the touch. "ViewGroup A" dispatchTouchEvent will trigger the "ViewGroup A" onInterceptTouchEvent first and if that method chooses not to intercept, the touch event is then sent to the "ViewGroup B" dispatchTouchEvent. In turn, the "ViewGroup B" dispatchTouchEvent will trigger the "ViewGroup B" onInterceptTouchEvent and if that method chooses not to intercept, the touch event is then sent to the "ViewGroup C" dispatchTouchEvent. "ViewGroup C" dispatchTouchEvent then invokes the "ViewGroup C" onTouchEvent. To recap, the dispatchTouchEvent is called at every level of the way starting with the Activity. The dispatcher is responsible for identifying which methods to invoke next. On a ViewGroup, the dispatcher triggers the onInterceptTouchEvent, before triggering the dispatchTouchEvent on the next child in the view hierarchy. The explanation above has been simplified and abridged for clarity. For additional reading on the touch propagation system, please review this detailed article as well as this doc on ViewGroup touch handling and this useful blog post. Sensey - Android library which makes detecting gestures a breeze. PhotoView - ImageView for Android that supports zooming, by various touch gestures.